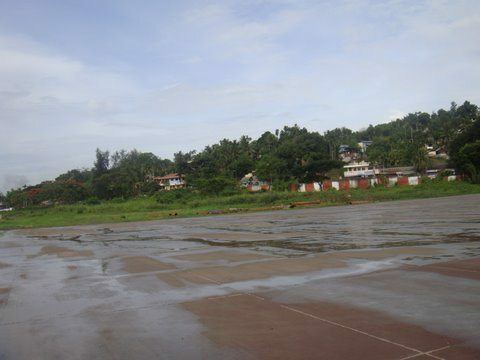 A Trip to Port Blair - Ghumakkar - Inspiring travel experiences. Islands, a union territory of India. As soon as you step on the Veer Sarvarkar Airport you can feel the freshness in the air. The city greets you with its pure and invigorating air. Even the sun light felt so fresh. Moving into the city was an enjoyble ride with the uphills and downhill roads. The roads are relatively clean and aren’t crowded. Infact during my stay there, I was surprised to see there aren’t any traffic signals opearting there. But this isn’t a question mark on the management but a reflection that the road sense of people is good enough and do not require the external disciplines to control them as unlike in our metro cities where the way we behave on the road can be the zor the jhatka for any foreign tourist. The Andaman and Nicobar Islands, spread on 8250 sq km are home to a number of aboriginal tribes, lie in the Bay of Bengal. The main islands in the Andamans are Land Fall Island, Middle Andaman, South Andaman, Port Blair and Little Andaman. Nicobar, lying to the south, comprises of Car Nicobar, Great Nicobar, Chowra, Teresa, Nancowrie, Katchal and Little Nicobar. The two groups of islands, Andaman and Nicobar, are separated by a deep ten degree channel. 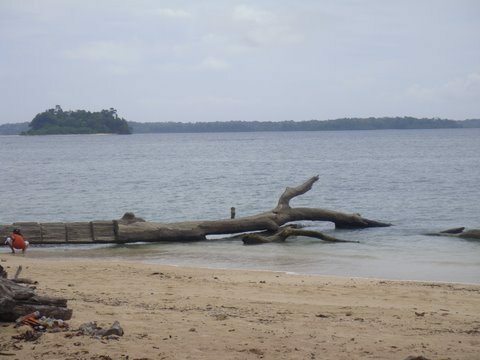 12 of the islands, particularly Car Nicobar in the north, are inhabited, while Great Nicobar, the largest and southernmost island in the group, is virtually uninhabited. The capital of this Union Territory is Port Blair, on the Andaman Islands. 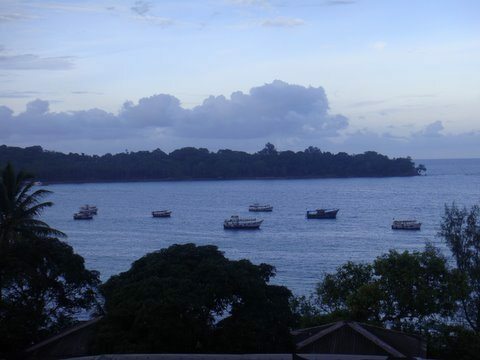 It is the largest town and a municipal council in Andaman district. All of us came in to just laze around since it was a very short trip and more so since we were awake all of the previous night at the Chennai Airport. But as soon as we entered the hotel, the first thing that me and my Dad did was enquire about nearby places to visit. So with all the glee and smiles we hired a cab and were out exploring!! 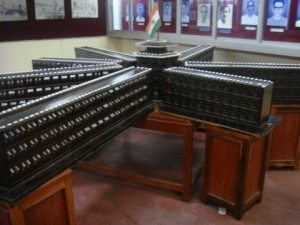 The first place to hit was the Cellular Jail. 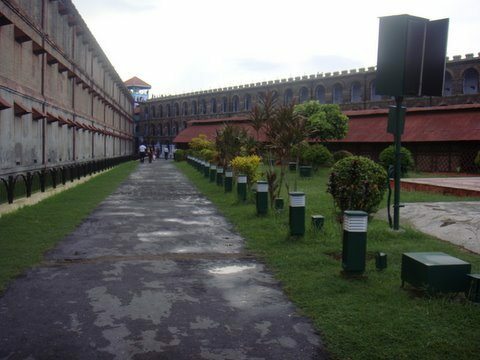 During the Indian freedom struggle, the enormous Cellular Jail was constructed between 1896 and 1906 to detain the Indian freedom fighters, mostly in solitary confinement, far far away from the mainland so that they do not have any route to escape. It is also known as “Kala Pani”, the name was given to it for the excruciating torture and torment meted towards the Indian Freedom Fighters. I was more than excited to view this monument after all the suspense it created in the history textbooks in school. The jail was built with seven wings but today only three are left to reflect the history.All prisoners were kept in isolation cells and subjected to a brutal work regime, with regular whippings and executions. This jail was briefly taken over by the Japanese during World War II, who added to the already existing tortures . The sound and light show in the evening brings alive the life of the prisoners more than 100 years ago in that infamous building. Although the show is more of sound than light and a little too long, it is worth while if you like to go back into history. I would definitely recommend it because though it is a powerful building,just doing a round of the jail doesn’t convey to us the miseries and the struggles that the walls have witnessed. The show brings life to the monument. Although damaged by the 2004 Indian Ocean earthquake, Port Blair survived sufficiently to act as a base for relief efforts in the islands. Thanks to my friendly taxi driver I got to see some of the badly affected areas. Another interesting element is that ever since tsunami damaged the island, the fields that were on a lower ground level have been covered with water. The government did not make any effort to drive out the water and with rains all the year round, those fields have sadly made way to be called lakes which are a common sight as you move towards the sea from the central part of the city. You can still find uprooted trees and tree trunks in the middle of these tsumani affected lakes canvassing stories of how once surrounded by lush green flora, today stand solitary in the middle of green waters to tell others of their glorious past. If you visit Andamans you cannot miss out on corals. 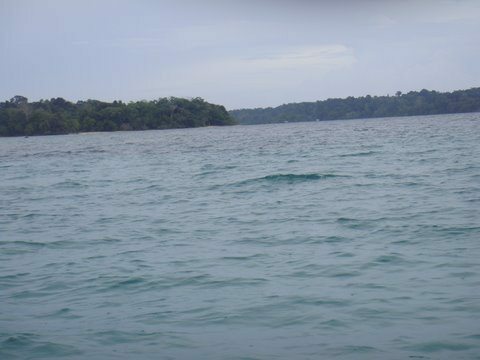 Havelock island and Neil island are famous for their corals through glass boat, scuba diving and snorkelling. I could not make it to these two as trip was very short and unplanned. One needs pre-planning here as you need to take ferries to reach these places that take only one or two rides in the morning and all the tickets are pre-booked. 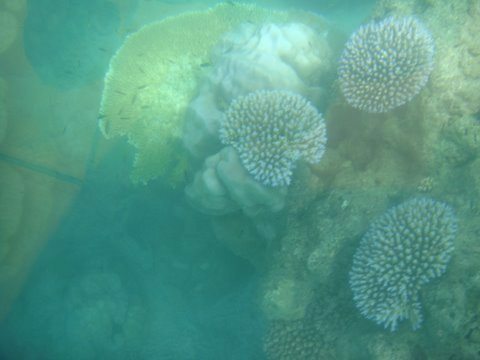 So as per the suggestions of the locals I headed to Wandoor beach where I got to see the beautiful corals through the glass boat. 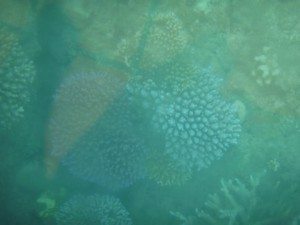 But according to people, the corals at Wandoor are nothing in comparison to the ones at Havelock, so if you are heading there, please pre-book or do that as the first thing when you touch your hotel. Others places worth watching are Viper Island and Ross Island which houses the ruins of the old buildings of the British regime. You can reach Port Blair through ship and by air. Flights operate only from Chennai and Kolkata, so you will have to make it to these cities first. Local travelling can be made through hiring taxis,autos or buses. With its lush greens and the blue of the sea, the picturesque beaches and golden sunsets, the island demands spending a week atleast to visit all the adjoining islands, monuments and sink in its serenity and spend some lovely time….. wishing if I could be this close to nature for ever. Excellent. I can’t wait to go there! Its one of my dream destination.Could you suggest some of the gud hotels there? Wow, those blues are really inviting. Thanks Tanya. Lovely post, and lovely pics too! I read this with much interest as we are planning to be thr in 2 mnths from now:) ty! I love those pictures ,and thank you for the share. Naresh…m unable to give you an idea of good hotels there coz i hardly checked that out coz we stayed at a hotel which was pre booked by my agent since our trip was decided on last minute and we grapped what was offered without any checking through n stuff…..so no idea on that front! Nandan…m surely checking on Patrick’s post! Mee…hey do enjoy ur trip dre…its a b’ful place…. Tanya you headed me off. I am such a lazy chap my general post on the A & N has been due for a year. Anyways u made up for it. Nice post. good photos. A friend recently told me the best way to see the A & N is to spend 10 days there and travel by bus!!!! Seems the islands are connected by an NH for all of about 300 hundred kms – Port Blair to I think it was Diglipur. The bus crosses via ferry across each Island. yes patrick..that absolutely true….one actually needs that much of time to satiate one’s need for all that peace, serenity and solitude that the island offers n appreciate its beauty too!! n the best way to travel by buses coz its gives u the local feel n buses being carried from one island to another on ferries!! 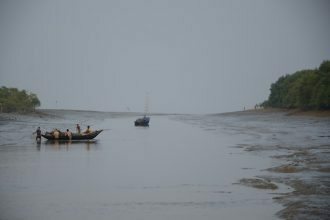 its a great place to be….so far away from our mainland n yet so connected n yet so different!! Nice one on Andaman Nicobar islands. The coconut trees and coral reefs reminds me of Lakshadweep, a few hundred kilometers off the coast of Cochin, in the Arabian sea. Lovely pics. Looks like you had a good time. I had to submit a report on A&N islands & your blog helped me a lot! Thanks. Could you tell me more about the architecture of the place. I know that timber is used in bulk there but thats all. Could you tell me more about the other materials used to built local houses..
ur post makes me want to go to andaman n nicobar soon…..hope i can manage it till next diwali…….. Very soon the faint evening glow, which was prevalent in the sky, vanished. The vessel did not have any light in the upper deck area. All the lights we had, was only the cosmic glow in the sky. I could not see anything ahead. The person sitting next to me was a mere silhouette. Up above there were innumerable stars and glowing planets travelling with us and below there was infinite quantum of water through which we were moving.